Fettuccine is a ribbon type pasta popular in Italy. In Italian, the word fettuccine means little ribbons, because of its appearance. Fettuccine is made from egg and flour. It is similar to Tagliatelle, except that tagliatelle is narrower. Long, flat, thick, ribbon-like strands of pasta. Traditional fettuccine pasta have thick ribbons that can really hold up a lot of sauces like tomato sauce and cream sauce. 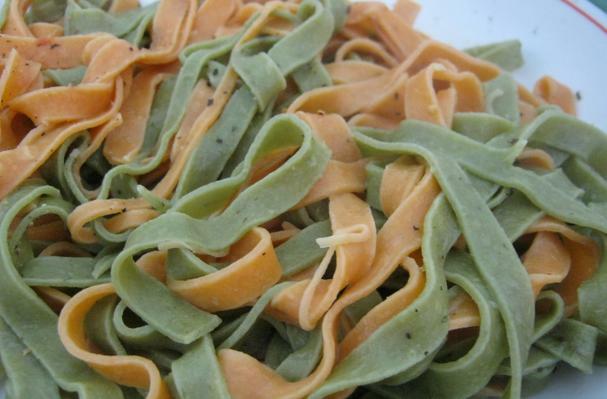 Buying: Fettuccine pasta is available fresh and dried in most stores or supermarkets. You can also make one at home using a rolling pin and a pasta dough recipe. Boil in a large pot, a gallon of water. When the water is boiling, add salt and drop the pasta into the pot and let simmer until aldente, about 10-15 minutes for dried pasta, and 5 minutes for fresh. One popular recipe using Fettuccine pasta is Fettuccine Alfredo. The dish was named after the restaurateur Alfredo di Lelio. It was originally just pasta tossed with cheese and butter or cream. As with most pasta, store fettuccine pasta in an airtight container in a cool dry place. Fettuccine means "little ribbons" in Italian and is a type of pasta popular in Rome. It is wider but similar to Boligna's Tagliatelle. Hello! Recently I came across <a href=http://welcomewineguests.com/wine_racks_and_holders>wooden wine racks</a>. What do you think?